An issue of al-Kown dated February 18, 1909. 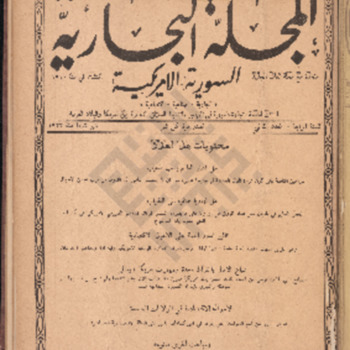 An issue of al-Kown dated January 16, 1908. An issue of al-Kown dated October 22, 1908. An issue of al-Kown dated March 21, 1907. Joseph El-Khoury stands with his Chamber of Commerce Award at a table with others, including his wife, Rose (Folder 2-38). Article about the Andrews, North Carolina Annual Christmas Party where the Joe El-Khouri Community Service Award was presented to Beth Hay. Based on context from the article, this was December 2006. Article about the Andrews Chamber of Commerce Banquet in 1995 featuring a picture with board member, Joseph Maroun El-Khouri. Joseph received the Community Service Award at the event.